Prof. Hughes and a group of J.D. students from Cardozo Law School paid a short visit to BNU law school. 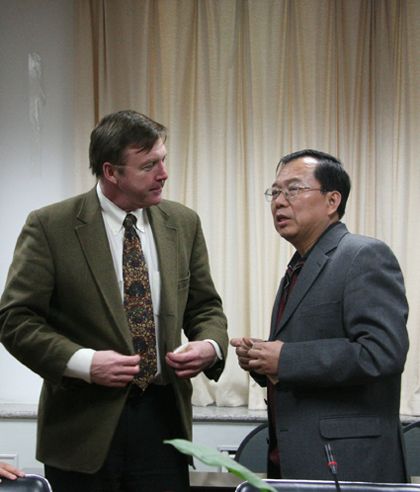 Prof. Zhao, Dean of BNU Law School, had a short meeting with Prof. Hughes and his students. They talked broadly about criminal justice and many other legal issues. Prof. Xue organized the whole event and acted as the interpretors at the meeting. Later, Prof. Xue and Prof. Hughes gave a joint lecture to American and Chinese students at a lecture hall. Prof. Xue’s lecture was well prepared and presented obviously.